The new crossover market has gained much popularity over the last few years. These versatile new vehicles fall somewhere between small SUVs and popular wagon models in size and functionality. Considering almost every auto manufacturer now offers a crossover option, it can be difficult to determine which model is best for you. 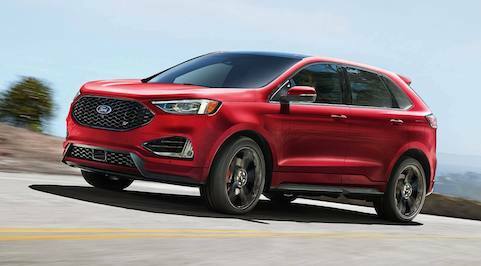 That’s why we’ve put together a quick comparison to show you how the 2019 Ford Edge stacks up to another competitive crossover, the new 2019 Hyundai Santa Fe. 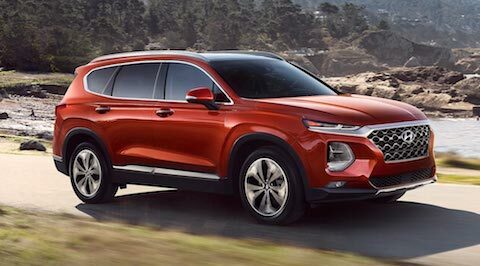 The new 2019 Ford Edge and 2019 Hyundai Santa Fe are similarly priced when similarly equipped. The Santa Fe is offered with a choice of seven model choices compared to four Edge models. The wider range of Santa Fe models includes several base models that are priced below the entry model Ford Edge. However, the midrange Santa Fe (Limited) is comparably equipped with the base model Ford Edge (SE) with a MSRP of $29,600 for the Santa Fe and $ 29,995 for the Edge. Although fuel economy between these two crossovers is also similar, the Ford Edge does offer better fuel mileage than does the Santa Fe. Two wheel drive models are rated at 22 city/29 hwy for the Edge verses 20 city/25 hwy for the Santa Fe. Four wheel drive models return 21 city/28 hwy ratings for the Edge and 19 city/24 hwy ratings for the Santa Fe. The Edge also has a standard cap-less fueling system. The fuel filler is automatically opened when the fuel nozzle is inserted and automatically closed when it’s removed. This eliminates the need to unscrew and replace the cap and it reduces fuel evaporation, which causes pollution. The Santa Fe doesn’t offer a cap-less fueling system. There’s no doubt about it, the new Ford Edge is more powerful than the Hyundai Santa Fe. Across all available engine types for these two models, the Ford Edge delivers more power and torque. The Edge’s standard 2.0 turbo 4 cylinder engine produces 60 more horsepower (245 vs. 185) and 97 lbs.-ft. more torque (275 vs. 178) than the Santa Fe’s standard 2.4 DOHC 4 cylinder model as well as 10 more horsepower (245 vs. 235) and 15 lbs.-ft. more torque (275 vs. 260) than the Santa Fe 2.0T’s standard 2.0 turbo 4 cylinder engine. The Edge ST’s standard 2.7 turbo V6 produces 100 more horsepower (335 vs. 235) and 120 lbs.-ft. more torque (380 vs. 260) than the Santa Fe 2.0T’s standard 2.0 turbo 4 cylinder model. As for handling, the Edge has vehicle speed sensitive variable-assist power steering, for low-effort parking, better control at highway speeds and during hard cornering, and a better feel of the road. The Santa Fe doesn’t offer variable-assist power steering. The wheelbase on the Edge is 3.3 inches longer than on the Santa Fe which allows for a smoother ride and more stable handling. To further your research we invite you to stop by Reynolds Ford of Norman and take a test drive. We currently have a wide range of new 2019 Ford Edge models to choose from and our friendly sales team is on standby to answer your questions.